Jack Spivey's just another down-and-out trying to stay alive, doing a little of this and a little of that. Sometimes that means making a few bucks playing ball with the Enid Eagles, against teams from as many as two counties away. And somethimes it means roughing up rival thugs for Big Stu, the guy who calls the shots in Enid. But one day Jack knocks on the door of the person he's supposed to "deal with"--and realizes that he's not going to do any such thing to the young lady who answers. This means he needs to get out of the reach of Big Stu, who didn't get to where he is by letting defiance go unpunished. Then the House of Daniel comes to town--a brash band of barnstormers who'll take on any team, and whose antics never fail to entertain. Against the odds Jack secures a berth with them. Now they're off to tour an America that's as shot through with magic as it is dead broke. Jack will never be the same--nor will baseball. If you like fiction that's fun, a little quirky, pure escapism, and that still has one foot in reality, then this is the novel for you. 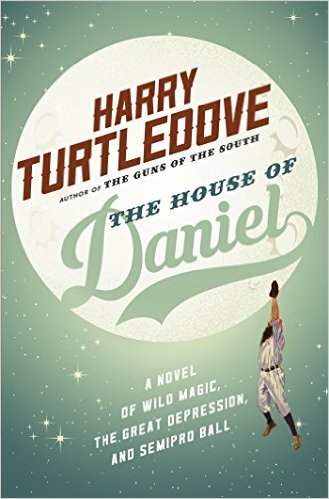 Part historical, part science fiction, it is a story about baseball during the Great Depression. It sparkles with the addition of strange characters like wizards and werewolves, zombies and vampires! Rest assured, these characters play very small parts and in no way detract from the historical aspects of the story. The main character is Jack Spivey. Like many during this era, he is out of work, but manages to survive with odd jobs here and there. He ends up playing semi-pro baseball with a team that call themselves The House of Daniel. Spivey is the narrator and he tells his story in a bold, humorous, and witty manner. I liked his voice and it kept me entertained. This is a fun novel for those who love baseball and zombies, or for light science fiction aficionados. A light and easy read to escape from the realities of life for an hour or two!